STAND OFF IN DUDLEY BETWEEN POLICE AND EDL SUPPORTERS……. – The Tundra Tabloids……. Around 30 masked protesters were ordered off the site as fights broke out. Several EDL members clambered onto the roof of the building earmarked for super mosque development. A police officer and local teenager were taken to hospital for minor injuries after the clashes. 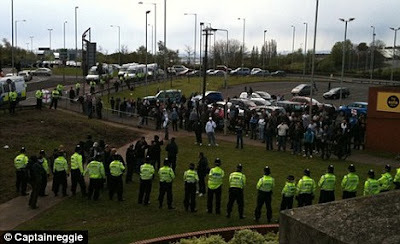 It comes just a month after 2,000 of far-right EDL protesters descended on Dudley to march against Islamic extremism. Some bashed down metal fences, threw metal brackets at police and even fought with their own stewards who were trying to calm them down. This morning, four men dressed in balaclavas and army fatiques remained on the roof of the old clothing factory where they unfurled banners reading ‘No to the burka’ and ‘no mosque’. Riot police are in a stand-off with ring-wing protesters who stormed the site of a planned ‘super mosque’. 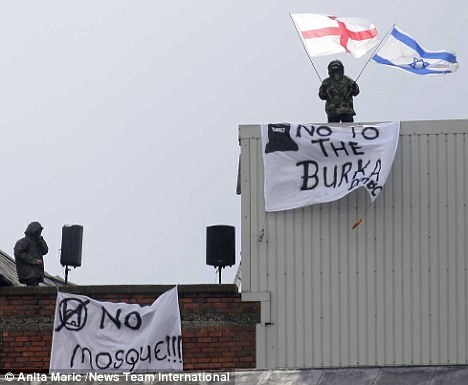 Four members of the far-right English Defence League scaled the roof of a derelict building in Dudley, West Midlands, yesterday waving anti-Muslim banners. Dozens of protesters gathered at the site on Sunday night after an internet campaign calling upon EDL supporters to attend a protest. Officers have cordoned off the area and are currently negotiating with the protesters. The protest came as the Dudley Muslim Association announced they were scrapping plans for the £18million mosque which have caused such controversy in the town. The mosque, which would have been built on derelict land, would have had a 65ft minaret, and the proposals have been dogged by controversy from the beginning, Two petitions of more than 50,000 signatures were gathered in opposition. Residents who objected said the mosque would dominate the skyline and be out of keeping with the town’s medieval character. They also objected to the mosque being built on land designated for employment use. Dudley Council threw out the application in 2007, but it was granted at an appeal the following year by a government inspector. Previous Post Previous Post I ONCE WAS LEFT BUT NOW I’M PRO-ISRAEL……. Next Post Next Post ATLAS RUNS NEW VIDEO ON FREEDOM BUSES ROLLING……. We're (cautiously) following this story over at Un:dhimmi too. Noteworthy that the Mail has, unusually, closed the story for comments. The Mail are backing the Conservatives to win. Unwilling to tolerate the likely negative reaction to their story (and by extension, the pro-mass-immigration, pro-Muslim Tories) in election week, perhaps? EDL stands for democracy and freedom. Therefore it stands against Islamisation of Britain.